Black out some cells of the grid. The black squares form stripes. 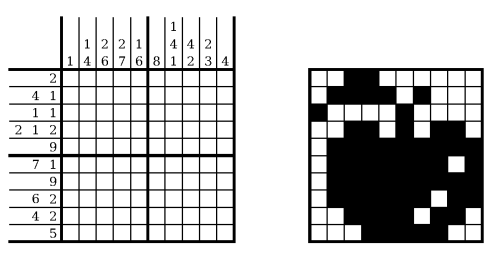 The number, order, and length is defined by the number sequences on the top and left edge of the grid. Each number represents the length of the strip of black squares in the corresponding row or column. Two stripes are separated by at least one white square.